After I finished work in London in April, Seth came to visit me for a few days and then we took off to Portugal for a week. I’m not really sure where I got the idea that I should spend my vacation in Portugal – I’d heard lots of good things about Spain and so I thought if I was to visit Spain, maybe I would visit Portugal as well. However, after a quick google search of Portuguese attractions, my interest in visiting Portugal greatly increased. Our 10-day trip from Spain to Portugal turned into a trip to just Portugal. I don’t think we could have done either country justice in 10 days and I’m glad we decided to spend the whole time in Portugal! We flew into the Southern coast of Portugal to visit the Algarve. 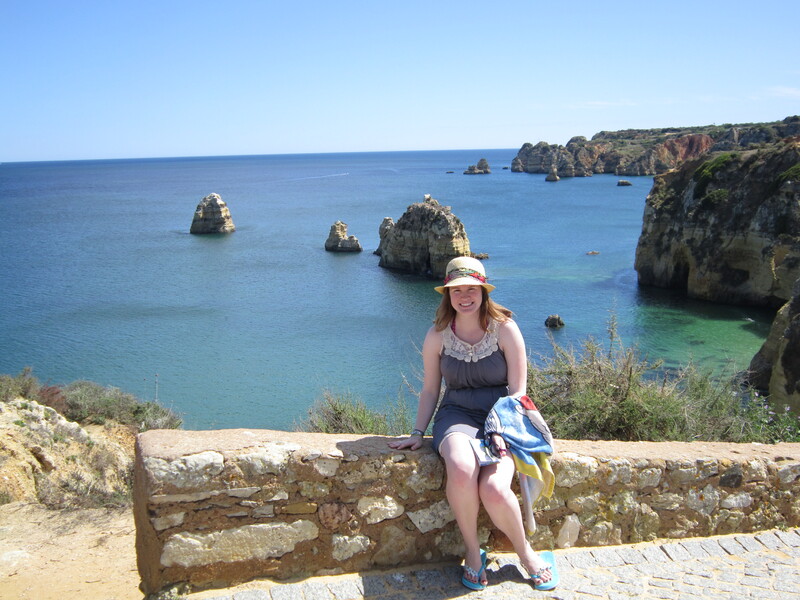 The Algarve is a long string of beaches and sandstone cliffs extending across the southern coast of the country. We stayed in a small town called Lagos for 2 days and had an amazing time exploring the area. We felt like we were in Paradise! Since we travelled in April, it was still sunny and warm, but not yet crowded with tourists. We spent our time eating in sidewalk cafes, strolling down white sandy beaches and enjoying as many flavours of gelato as we could find! It’s not quite warm enough in April for swimming, but if you’re used to Newfie summers I think you’ll be able to handle it! After a few days in the Algarve, we took off for Lisbon. I can’t say a whole lot about Lisbon because we spent most of our time doing attractions outside of the city, but the city has a great feel to it and the cobblestone roads make you feel like you’ve gone back in time a few years. We spent a day hiking along the Arrabida Coast line – it reminded me a lot of home and we enjoyed the opportunity to experience a lesser-seen part of Portugal. For the second half of our trip, we flew to the Portuguese Island of Madeira. Portugal has two sets of islands located near the coast of Morocco: the Azores and Madeira. Madeira was definitely my favourite part of Portugal and I’d recommended it to anyone as a fantastic place to go on vacation. Madeira is much further south that the rest of Portugal and so it’s a lot warmer; even warm enough to go swimming all year long. 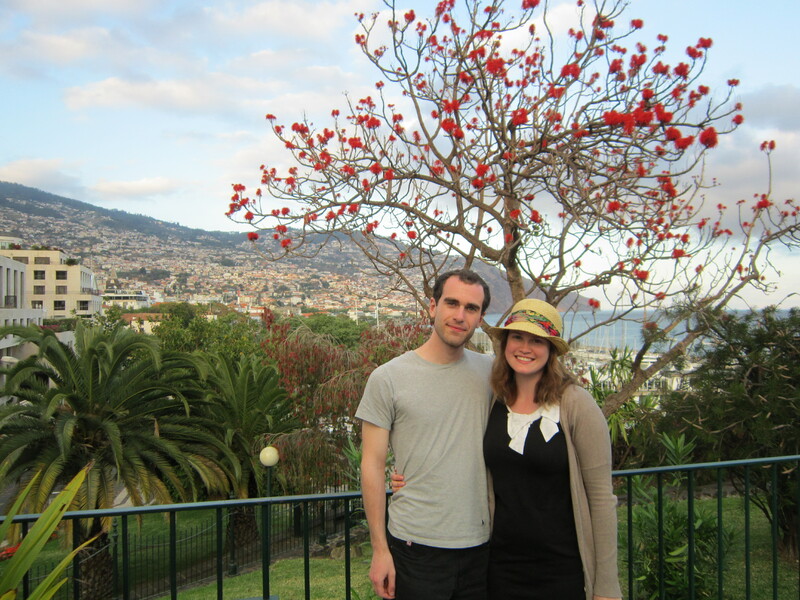 We stayed in Madeira’s capital, Funchal. Unfortunately most of the beaches in Madeira are small pebble beaches, but if you’re willing to take a short boat ride to the nearby island of Porto Santo, there’s a white sandy beach that stretches for 9km! Madeira is an entirely volcanic island, formed of high cliffs and mountains rising right out of the ocean. It’s hard to go anywhere on the island where there’s not a breathtaking view! There are also a lot of tropical and exotic plants on the island. Usually I don’t pay that much attention to the flora, but it’s impossible to ignore it in Madeira. One day we took a cable car up the mountain and visited the most beautiful garden at the top! I can’t tell you much about the actual plants, except that you’ll completely lose yourself in all the bright colours and beautiful scents! 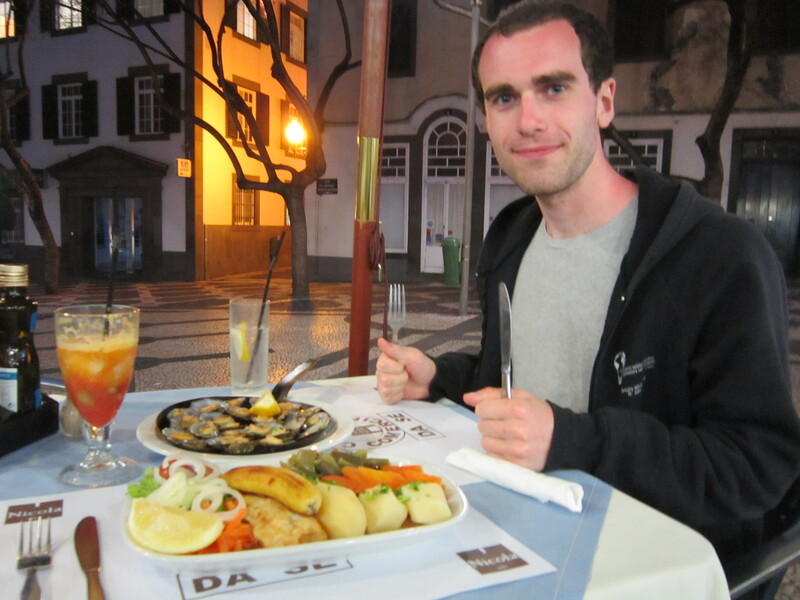 Finally, Madeira also has incredible sea life and seafood. Every night Seth and I would try something different. Madeira’s special is black scabbard fish, which they serve with fried banana – it is delicious! On our last day, we went out on a catamaran looking for sea life. We were lucky enough to find about a dozen dolphins that entertained us for the better part of an hour. Unfortunately I lost my hat overboard, but the crew was nice enough to fish it out for me! Anyways, Portugal has now become one of my favourite European countries that I’ve visited and I think you should make this a must-visit country on your next trip to Europe!